Dadex CC Pressure Pipes and rubber rings have been used in a variety of applications all over Pakistan. 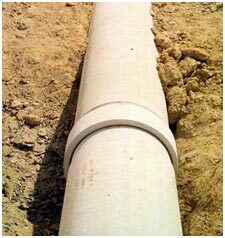 They are most commonly used in water supply schemes - for pressure mains and distribution lines. Other applications are sewage disposal – where pipelines must withstand particularly high crushing loads and in the supply of silty water for irrigation. Dadex CC pressure pipes can also be used for the following types of liquid: Galvanic, Bimetallic, Chemical Reaction, Biological, Hydrogenation, Direct Oxidation, and Electrolytic. 80, 100, 150, 200, 250,300, 350, 400, 450, 500, 600, 700, 800mm (Class B, C, D) and 1000mm (Class B) in 4m length.